Thousands of people attended last year's Dovetone Show. PLANNING has commenced for the 2015 Doveton Show and the committee is calling on local residents to lend a hand. The Doveton Show has grown and developed into a popular community event. The 2015 event is scheduled for September at Myuna Farm. 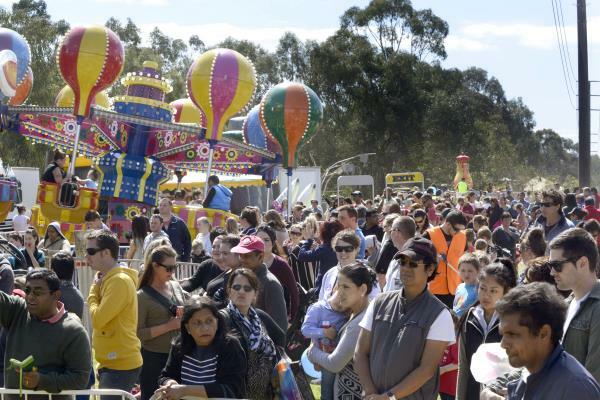 The 10th anniversary show in 2014 Doveton Show attracted more than 20,000 visitors. Chairman of the Doveton Show Committee Pam Lewis said families from far and wide came together in Doveton to experience a wide variety of attractions, demonstrations, rides, show bags and entertainment. “The concept of a gold coin donation per person for entry into the event is key feature to ensure it remains a low cost alternative for local families compared to the Royal Melbourne Show which is held during the same time each year,“ Mrs Lewis said. She said the annual event was a community driven initiative that needed local people to get involved in the planning and delivery stages. Skills that would be particularly welcome include administration, customer service, event management, website monitoring/ development, marketing and promotion, entertainment audio/ staging and the arts and crafts. The Doveton Show annual general meeting will be held at Myuna Farm at 7pm on Wednesday 20 May. “We would love to see some new local people become involved, even if only for a limited amount of time,“ said Mrs Lewis. For further information on the Doveton Show email info@dovetonshow.org.au or visit www.dovetonshow.org.au.